Night Glow The Night Glow gas fire pit brings rusticwhimsy to your outdoors. 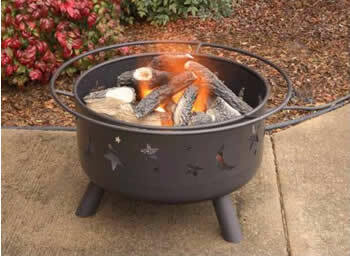 The 24-inch steel bowl features a charming moon and star cut-out detail that reflects the firelight in the evening sky. Available in black. Comes complete with the fire pit, stainless steel burner, logs, lava rock, flex tube and connection hose with shut off valve and regulator. Comes configured from the factory to burn LP but it comes with a conversion kit to change over to Natural Gas.